Thank you for the honor of this nomination. I hope I can do the award nomination justice with my novice blogging attempts. layedbacklife and below is a link with her answers, questions and nominations. I am also new at computers and copy/paste issues so pardon the non fancy appearance. Now on with the burning questions. 1. What is your favorite dessert? 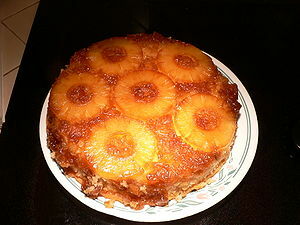 Pineapple upside down cake is one of my favorites and no bake cookies. 2. What makes you happy? Well, funny thing is I am just finding that out. I am a mother of three grown sons that have their lives and are starting families of their own. That makes me happy. However, I have been separated for around 3 years now from my husband of 25 years. So, I am at 42 redefining what makes me happy. I guess the short answer to that is I have freedom of choice now. No longer to I have to decide if or even when I will cook or clean. I can sleep in or stay up late and hold my own remote. The choices I have both little and big now are what is making me happy today. 3. Do I have a favorite YouTube? No, I do not do much YouTube yet. The most I have seen have been a few pranks my sons thought were funny. I am YouTube illiterate! For now anyway! 4. What genres do you read? Well, I use to love a good old romance novel when I was a lot younger. When the boys grew I would read stuff like Harry Potter and The Twilight Saga. Now, I can’t get enough of self-help books or articles. My three favorite authors right now are Louise Hay, Dr Wayne Dryer, and Deepak Copora. 5. What is the one thing you like about your life now? I like that it’s a new life. I love the fact that I still can do something with my life. I like the fact that I no longer feel hopeless. 6. If I could use a time turner, which part of my life would I want to relive again? This is easy as pie for me! The births of each one of my sons. I know a lot of parents probably give that answer but I was happiest pregnant and giving birth to them was amazing. 7. What sport are you good at or wish you were good at? I had a physical deformity as a child so my favorite sport was kick ball but my problems were in my hips and legs so I often didn’t get to play. 8. Where is the best place to travel to based on my experiences? I would have to say Northern California. That is where I am originally from. The redwood forest is amazing and you also are right on the pacific ocean. I lived specifically in Eureka. The architecture is Victorian and amazing. 9. Are you still in contact with childhood friends? Yes, on Facebook I have 3 childhood friends I keep in contact with. Social media is amazing! 10. How do you manage stress? Prayer and meditation and deep cleansing breaths! 11. What is your favorite time of day and why? I love the night! The world seems more peaceful at night. I enjoy reading posts from these folks and I hope you enjoy them too! Nominee’s please answer the 11 questions http://layedbacklife.com did for me. I hope I did this all correctly and have done this award justice. Happy blogging to all of you!